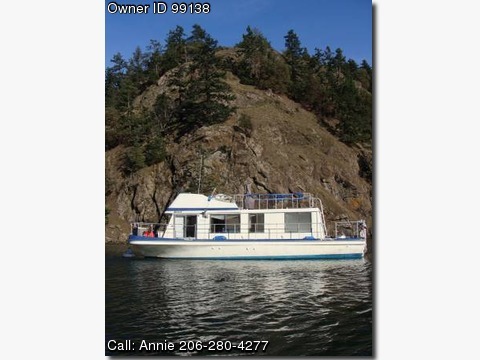 Please call boat owner Annie at 206-280-4277. Boat is located in Anacortes, Washington. Moored in Skyline Marina, Anacortes 98221. The sell of this 1977 40&#39; Cruise A Home Corsair comes with many extras! 3 sources of heat: electric, propane (2 heaters: 1 in bedroom, 1 in front room) and wood. includes electronics, compass and navigational gear, docking lights at flybridge and captains area. and a few crab traps! The boat does need work but I&#39;m sure with a bit of elbow grease and know how, someone will have a hell of a boat/home! Boat Name: Rock N Row. Beam: 12 ft 0 in. Minimum Draft: 2 ft 10 in. Bridge Clearance: 15 ft 6 in. Headroom: 6 ft 6 in. Fresh Water Tanks: 1 (50 Gallons). Fuel Tanks: 1 (100 Gallons). Holding Tanks: 1 (35 Gallons) .